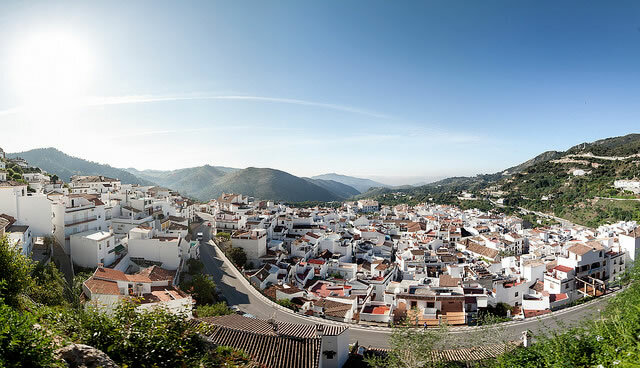 The beauty of the “pueblos blancos” or white villages of Andalusia is becoming general knowledge to most visitors to southern Spain. Many, such as Mijas Pueblo and Benalmadena Pueblo, have developed into tourist towns with loads of restaurants, souvenir shops and the like. One white village, however, despite being so close to Marbella and the coast, has managed to retain its unspoiled and peaceful state. 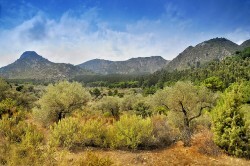 Ojén sprawls over the hillside 650 feet above the Rio Real valley between the Sierra Blanca and the Sierra Alpujata mountains and close by can be seen the Serranía de Ronda, with that magnificent view of Marbella and the coast. When staying in a holiday villa in Marbella or any of the coastal towns close by, this is a perfect day out. Apparently the name derives from the Arabic word “hoxán” which translates to bitter or rough. It is unknown why the Moors might have given a village in such a beautiful location that name, but the area is well known for its mineral wealth, with much iron, lead, nickel and talc available in those mountains, which is probably why they picked this scenic spot. Since the days of the Moors, the town has grown and is now cut virtually in half by a modern highway. On the one side, the newer part of Ojén has modern buildings sprawling up into the hills, close to what remains of the Moorish castle, now just a few rocks scattered over the hillside. The older town is far more of interest, with its traditional narrow, cobbled streets, beautiful white houses and some original, and still working, water fountains along the way. On turning each corner pretty homes, with geraniums or bougainvillea flowing from the balcony, attract the eye and the sound of caged songbirds fills the quiet air. Lunch or dinner can be enjoyed in the town square which surrounds the church of the town and little shops can be found around every corner, selling groceries, fruits, vegetables and even artwork produced by the village’s residents. The town’s previous major claim to fame was the production of an anise liqueur, called “guardiente de Ojén,” popular with Spaniards as a splash in their morning coffee, which was originally produced locally. The drink was also a popular export and was especially prized in New Orleans in the U.S.A., especially during their Mardi Gras festivities. Nowadays production has been taken over by a distillery company, Dominique Mertens Impex. S.L. and the building used to produce the liqueur has been turned into a wine museum. 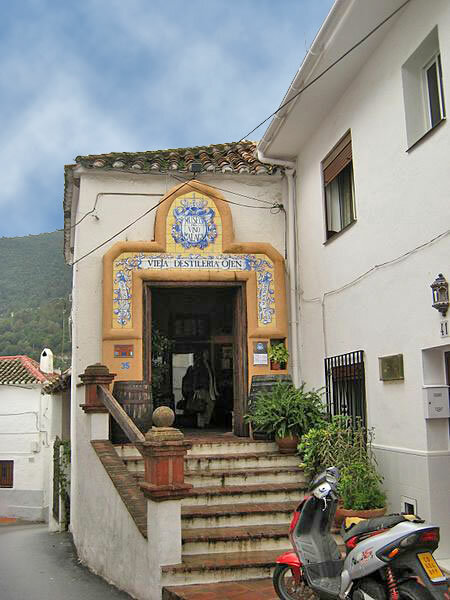 This museum sells excellent Spanish wines along with various artistic pieces made from glass and pottery produced locally. Close to Ojén, up in the Serrania de Ronda, can be found the Refugio de Juanar. This was originally a private hunting lodge, belonging to the wealthy Larios family which regularly welcomed King Alfonso XIIII. Nowadays the lodge has been transformed into a hotel. The location is perfect for anyone looking for fresh air and beautiful views and amazing peace and quiet, 3,000 feet above the tourism mecca of Marbella. While the hotel is no longer a hunting lodge, ibex, wildcats and eagles still abound in the area and will often be encountered when out for a hike.